I found it quite amazing how deep the London tube has been dug. It’s the oldest subway in the world and it’s one of the deepest ones too. Just how they built it amazes me. As a comparison the older lines of the Paris subway are just under the street so much easier to build. The escalators in the stations that have them are endless and when going down you just don’t want to let go of the rail. In some stations they couldn’t build an escalator so they had to build elevators. I had that in Russel Square station when I arrived to go to the hotel. After a few days I decided I would try to take the stairs just to see how deep it really was, I arrived on the top in a sweat. The tunnels were built about 20 meters underground which doesn’t seem like that much until you end up walking those stairs. I like how the wide-angle lens on the photo gives an exaggerated sense of height. This is a single photo, not an HDR. Which I retouched with Lightroom and Topaz adjust. An additional note: I big thanks to everyone at http://photocamel.com/forum/ a great photographer forum for newbies and pros. 10 Jan	This entry was published on January 10, 2010 at 7:29 pm. It’s filed under Buildings, Canon 500D, interior photo, London, non-HDR and tagged Canon 500D, escalator, interior, London, metro, non-HDR, tube, underground. Bookmark the permalink. Follow any comments here with the RSS feed for this post. 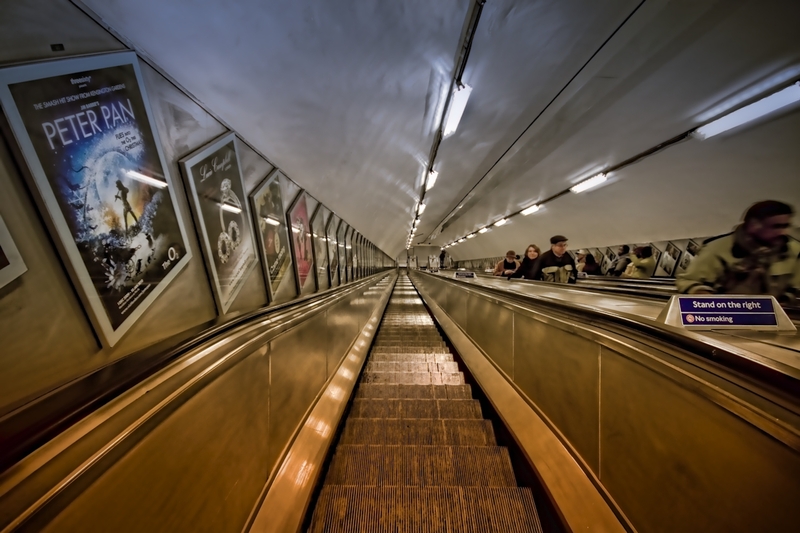 As Hy indicates, the Saint Petersburg Metro has the longest underground escalators in the world. Three stations have escalators rising/falling 217′ (66 m) over a length of 433′ (132 m).